Rumours are getting stronger that Google are readying up to launch their new Nexus device, and if all the rumours are true, we are expecting to see a new Nexus device from LG (Similar specs to the LG Optimus G), a new device from Samsung (lower end Nexus), and another one from HTC (5 inch and above?). Possible? Yes. A new Nexus device is a definite given the one year product cycle implementation, but looking at past sales records for the Nexus brand devices, I do not believe Google would be foolish to cannibalize their own product sales given the small Nexus market penetration. It appears that Google could be allowing the Nexus branding to be associated with new phones provided they adhere to Google product ethos in terms of support. This would be a new Nexus program. The strength of the Nexus product line lies in that they are manufactured and supported by Google, hence they are the first to acquire the latest software releases. The Jelly Bean software was rolled out since July, but only the Samsung Galaxy S3 is getting Jelly Bean (official) recently. HTC users would still be relying on third party ROM support, and LG users can only endure the pain of LG locking the bootloader of the Optimus 4X HD and are still stuck on Ice Cream Sandwich. Well, hopefully with the LG Google Nexus, LG would relent and supply phones that are more user friendly to the developer community. What’s the new name for Android 4.2? From GingerBread to Ice Cream Sandwich to Jelly Bean and to now Key Lime Pie. What’s good about the Key Lime Pie? 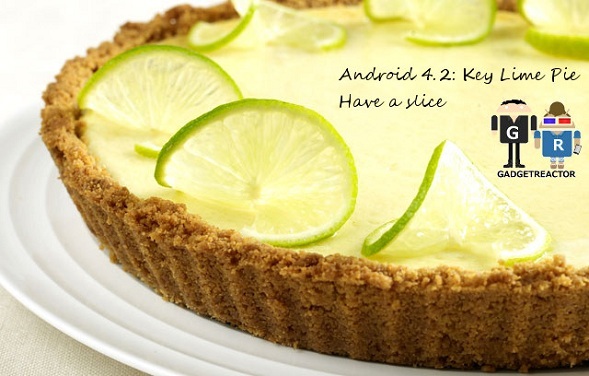 Well, great news on the software front is that alongside the new Nexus device, Google will also be releasing Android 4.2 (Key Lime Pie). Key features expected are the Customisation Center. It offers an ability for users to change icons, colours, themes, etc. It could be considered similar to built in icons and theme support through launchers like GoLauncher or Nova Launcher. The interesting point here is it improves the Android Eco-System by allowing Phone Manufacturers to build their different UI in the Customisation Center and could allow phones to be updated quicker. Just like how SIRI has been updated and tweaked, the Google Now Engine is expected to become smarter after having had some Key Lime Pie. We are hoping it extend beyond the search and Google services integration and grow deeper into the phone, with the ability to adjust system settings such as WiFi, Bluetooth, brightness, volume etc. From Project Butter to Roadrunner, Google is anticipating a better optimised experience through Android 4.2 to make better use of the now common quad-core devices. It is also rumoured to improve Battery Life which would be a useful upgrade for many of us. The specs are good but with the bevy of new flagship models from the rest of the manufacturers and including LG own Optimus G, it’s all quite similar. What would differentiate this phone is the ability to install the newest software for people who enjoy tweaking their phones like me, and perhaps the wireless charging but the accessories for that are going to be expensive. The last Galaxy Nexus arrived in Singapore 2 months (Jan 12) after its announcement and we fear that it’s going to be the same situation for the upcoming Google Nexus “G” from LG. We do hope that if indeed, manufactured through LG, they improve their distribution channels for the upcoming phone and bring it to Singapore early.